Here is a look at the 32 players advancing to Day 2 in the money from Flight C of the $600 No-Limit Hold'em Re-Entry event. These 32 will join with the 33 from Flight A, the 32 from Flight B, and any that bag in tomorrow's Flight D. Day 2 play will resume at 12:00 noon Wednesday March 22nd. So far, only one player has bagged in multiple flights. James Frangoulidis bagged 33,000 in Flight B, and then 154,000 in today's Flight C. Frangoulidis will be compensated $1,200 for his smaller stack, and carry only the 154,000 forward into Day 2 play. In the last hand of Flight B there was a double elimination, resulting in the player that started the hand with the largest stack (Mark Bulbulian) to make the money. Because the prizepool has not been calculated yet, Mark will have to wait until Wed. to find out how much he cashed for. There are currently 33 players remaining in Flight C, meaning that when they lose one player, the remaining 32 players will bag up for the night and return to play Day 2 on Wed. March 22nd. After a three way all-in, Robert Angotta was just eliminated in 9th place, and Ed West nearly tripled up. Facing a raise from the chip leader on the button, Anogtta shoved all in for around 30,000 in the small blind, and West shoved for around 20,000 in the big blind. The chip leader called, and the three tabled their hands. The flop came Q♦9♦4♦ giving Angotta a set of queens, but also giving West a flush for the lead. The 5♣ turn did not change the hand, and the 3♠ river gave the chip leader a straight to win the side pot. 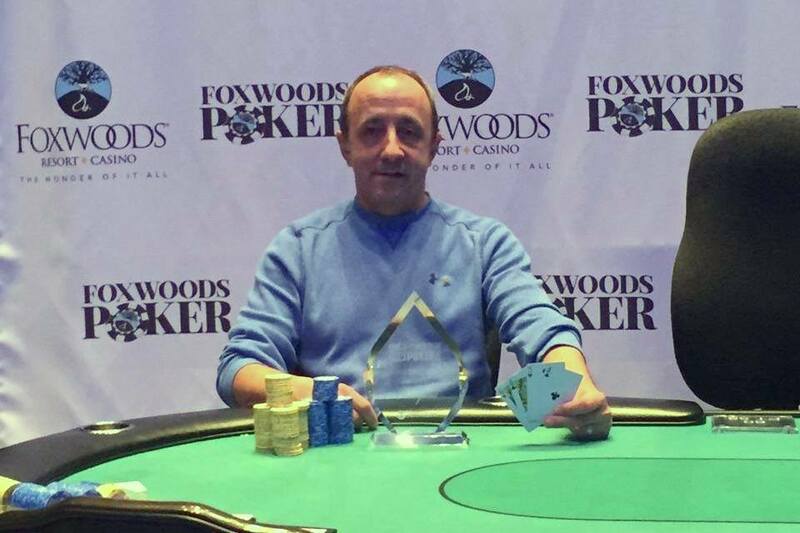 The main pot was shipped over to West with his flush, and Angotta was eliminated in 9th place. We have reached the final table of ten. After one player is eliminated, the final nine will all be left int he money, and guaranteed at least $644. For a look at the full prizepool/payout schedule for this event, please see this link. There's around 65,000 in the middle, and the board reads 9♣8♠5♠. A player in middle position bets 15,000, and Zach Donovan pauses in the hijack, before announcing that he is all in. The player in middle position snap-calls, and quickly turns over 8♣8♦ for a set of eights. Donovan tables J♥J♦ for an overpair to the board. The 5♣ turn improves Donovan's opponent to a full house. Unfortunately for Donovan, the Q♦ river does not improve his hand, and he is eliminated from play. Donovan pushes his stack out in front of him and stands up, when his opponent says, "Bye bye birdie!" Donovan walks away without saying anything in response. "Please put that he said, 'Bye Bye Birdie,' in the blog," table mate Nick Palma says. Both Event #1, Flight C and Event #4 are currently on their dinner breaks. Event #1 will return around 8:05pm. Event #4 will be resuming momentarily. There were a total of 73 entries in today's $300 PLO High Event, generating a prizepool of $18,411. The top nine places will make the money, with first place taking home $5,524. There were a total of 265 entries in the third flight of the $600 No-Limit Hold'em Re-Entry Event #1. The field will play down to the final 32 players before bagging and tagging later tonight. Those 32 players will join the 33 players that advanced in Flight A, the 33 that advanced in yesterday's Flight B, along with any that advance in Flight D tomorrow to play Day 2 on Wednesday at 12:00pm. All players that make Day 2 will return in the money, and any player that bags in multiple flights will take home $1,200 for each additional stack they bag, with only their largest stack advancing to Day 2. There are currently 228 entries in the third of four starting flights in Event #1, and registration is still open for another 60 minutes. There are currently 50 entries in today's PLO High Event, and they are in the midst of playing Level 4 (75/150 blinds). Registration will close at the start of Level 7. Please see below for additional information for this event. After a chop deal was made between the final two players, splitting the first and second place prizes, Kenneth Hoey is the second place finisher. All Day 1s will play down to approximately 12% of the field. All players who make it to Day 2 will return in the money on Wednesday March 22nd at noon. This is a best stack forward tournament. If you bag chips more than once, you will receive a payout of $1,200 and play your best stack forward. Day 2 and 3 levels will be 60 minutes each. Here is a look at the 32 players advancing to Day 2 in the money from Flight B of the $600 No-Limit Hold'em Re-Entry event. These 32 will join with the 33 from Flight A and any that bag in Flights C and D. Day 2 play will resume at 12:00 noon tomorrow Wednesday March 22nd. In the last hand of the night, two players were eliminated on the bubble, leaving 32 players to advance to Day 2 from this flight. Since 33 players made the money, Mark Bulbulian will min cash, as he had the most chips to start the hand prior to his elimination. Because we do not have the prizepool yet, Mark will have to wait until Wed. to find out how much he cashed for. But in a seemingly unprecedented situation, we have our first casher of this event, before the prizepool is even determined.